This image features a seemingly disembodied eye. This is the case because it looks abnormal to a person viewing the picture and creates a sense of intrigue. This could cause the reader to view the image and then read the text. The text included with the picture are two bible verses from the book of Psalm. In english they read “Psalms 19:8 The precepts of God are right, giving joy to the heart. The commands of God are radiant, giving light to the eyes.” and “Psalms 33:18 But the eyes of God are on those who fear him, on those whose hope is in his unfailing love. ” Both bible verses use the term “eye” which correlates to the picture rounding out the poster nicely with well done simplicity. 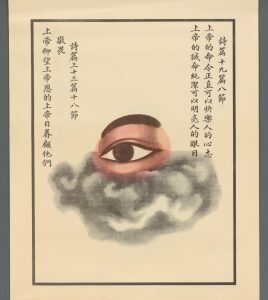 Interestingly enough the poster seemingly has nothing to offer to people who are illiterate as most of the message is found in the text and the eye is supplementary to the text. Among the other posters in the gallery this seems to be rather unique. The intention of the poster is to peak the viewers interest so that they might find out more about christianity. I feel that this poster can be viewed in any culture and have the same effect on people. Overall I believe this poster is effective to literate Chinese people. 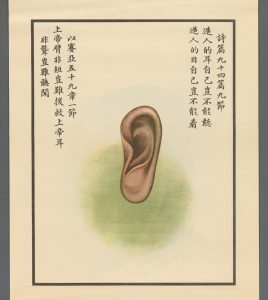 This poster features a disembodied ear for much of the same reason as the eye. It would draw the viewers eye and make them inquire about it. It includes two bible verses but this time it includes one from the book of psalm and one from the book of Isaiah. In english the verses are “Psalms 94:9 Does he who implanted the ear not hear? Does he who formed the eye not see?” and “Isaiah 59:1 Surely the arm of God is not too short to save, nor his ear too dull to hear. ” Both verses reference the ear of god and tries to instill some Christian values in the reader. This type of poster is pretty unique to the gallery as there is a series of these and then most poster are unlike this. I feel that this is a poster that could transcend cultures as the formatting is strong and I believe this poster would be effective to literate people all over the world. This poster has a picture of a disembodied hand much like the others. A very simple design yet eye catching. Like the other posters in this exhibit this design makes the reader inquire after seeing it. The text in english reads “Psalms 24:4 He who has clean hands and a pure heart, who does not have improper desires or swear falsely will receive a blessing from God and righteousness from the God of his salvation.” and “1 Timothy 2:8 I want men everywhere to lift up holy hands in prayer, without anger or disputing. ” Both of these passages have to do with hands and therefore they are connected with the picture. 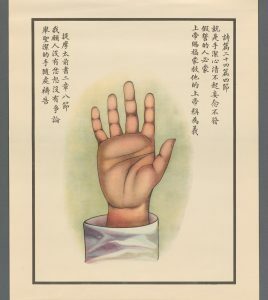 This poster calls everyone to use their hands to pray. A call to action in a sense. It tries to convince the reader that they should pray to god and convert to christianity. This poster like the others seems to be unique to the gallery. There is a series of posters like this and the others share very little similarity. It seems to me that this poster is effective and would be effective all over the world as long as the viewer is literate. These posters are intriguing to me as they all have good symbolism in the images depicted, and draw upon the biblical passages that they are associated with. The most intriguing aspect of these three posters are that seemingly the images are meaningless without the capability of reading. At this point in time a lot of Chinese people were uneducated and could not read. Most posters have depictions of activities or other iconography associated with them, but seemingly illiterate people were not a consideration for these poster. These posters also seem to stand out in the gallery when looking through it. The depiction of the body part really makes a unique impression on the viewer. This is why these posters were effective to people who could read because they images are intriguing and make you want to find out more about it. Most notably there is no inherently Christian iconography associated with these posters. There are no crosses or bibles or anything of that effect so if one saw this on a street it would not be easily recognizable that the poster is related to the religion. Overall I believe this would be an effective poster to literate Chinese people.